Maitre Andre Asselin is perhaps the most urbane, humble and accomplished man I have ever met. He is soft-spoken, worldly, and a very well respected lawyer. When I first met him, I didn’t know who he was, but as I became better acquainted with him and his family I came to understand that I was in the company of a man who speaks little but says much. That much will be apparent in both his answers to our questionnaire, as well as in a blog post I wrote when I first met him, a few years ago. 1. Quel est l’endroit où vous exprimez le mieux votre créativité: la salle du conseil, la salle de classe, la chambre à coucher ou la cuisine? 2. Un extraterrestre est sur le pas de ta porte. Tu aimerais lui présenter notre culture et notre style de vie en un temps limité. Quels sont les trois lieux où tu l’emmènerais, et pourquoi? Pour qu’il puisse partager notre bien-être. 3. Comment décrirais-tu ton état d’esprit actuel? 5. Ton nouvel ami extraterrestre te demande la définition du “bonheur” (une notion qui n’existe pas sur sa planète). Quelle serait ta définition? 6. Si tu devais être enfermé dans une salle aux murs blancs pour une durée indéterminée, quel type d’oeuvres d’art emporterais-tu avec toi? 7. L’extraterrestre gagne 10 millions de dollars à la loterie et te demande des conseils quant à l’utilisation de cet argent. Que lui suggérerais-tu? 8. Si tu pouvais changer un élément de ta personnalité, que changerais-tu? 9. Quelle est, selon toi, ta plus grande réussite? 10. Avant de retourner sur sa planète – voyant que la Terre n’est pas faite pour un extra-terrestre sensé – l’extraterrestre te pose une dernière question : Comment trouves-tu la paix sur une planète comme la Terre? Shortly after I opened the gallery about 4 years ago, a new client rang the bell. As I waited for him to climb the stairs, I noticed his height, his elegant and well tailored cashmere coat, and the ease with which he carried himself. A man who appeared to be in his sixties, with a full head of grey hair and a formal demeanor, made his way up and slowly bent down to take off his galoshes. As he straightened up, he put his hand out, introduced himself and asked if I was the owner of the gallery. When I indicated that I was, he asked if he could come in and talk about posters and my knowledge of them. Up until that point, when folks would wander in to the gallery, more often than not, it was curiosity that had driven them in, but with this man, it was clear that L’Affichiste had actually been his destination. He walked in and took measure both of the gallery as well as of me. I seem to remember him asking me very polite questions about how I started collecting, why I had chosen to open the gallery, how and where I bought and sold my posters – the usual questions, but phrased very delicately and very precisely. He looked both grandfatherly as well as a little frightening – a man who was not to be trifled with, and one who could be deadly serious. When I later learned that he was a much-respected lawyer with a well-established French Canadian firm, I was not surprised. He told me the story of how his father’s brother had been an architect in Paris at the turn of the century, and how when this uncle returned to Quebec, he brought with him a half dozen posters from Paris. The posters – which he described to me – had adorned the family cottage in a remote town called Trois Pistols until the uncle died. At that point the posters were handed down to other family members – some remained in the cottage, some were dispatched to other locations, one was water damaged and thrown out by a cleaning lady – and now, 100+ years after they were printed, according to the gentleman in front of me, they were in need of repair. From the descriptions of the posters it seemed to me that we were talking about very famous posters – some by Mucha, others by Steinlen – but without images, or the posters themselves, there was no way to tell if the posters were vintage, what state they were in, and if, indeed, they could be repaired. I told my visitor as much – I said that without seeing the posters first-hand I couldn’t even hazard a guess as to what he had inherited, what restoration might be possible, what the repairs might cost – the only way I might be able to help was to see the posters first-hand. He said that because of their size they were hard to manage and that he would take what I said under advisement. He thanked me very much for my time, gave me his business card, shook my hand very formally, put his galoshes back on and left. A few months later, his wife and her sister-in-law appeared at the gallery together – each one carrying a large poster in a thin frame. Neither poster had ever been covered by glass, and both were in very serious states of disrepair. Water damage, harsh weather (the cabin was not weather proofed), mouse nibbles, cracked ink and stained and missing parts of the images – if you were looking for posters which showed every possible sign of neglect and disrepair, these were excellent examples. They had been nailed to their flimsy frames with ancient thumb-tacks, they had been trimmed inexpertly, they were cracked and torn … in short, these were literally shadows of the posters which had been brought back from Paris a hundred years previously. But underneath all the grime and dust I could clearly see that both posters were signed in the stone by Steinlen – one was an iconic image of Steinlen’s daughter Colette and her favorite cat (1), both were printed by Steinlen’s official printer of choice, and each was undeniably the real thing. The ‘Antiques Road Show’ moment came when I told the ladies that the last price – at auction – for the Lait Pur Sterilize poster (Colette and her cat) was close to $50,000US. Granted, it would take a lot of money, a great deal of time, and the care and meticulous attention of an expert restorer, but the poster we were looking at was – if they could afford it – worth the investment. They consulted, the spoke with their husbands, they thought about it for months, and then they decided to go forward with the restoration. I respected the delay – we were, after all, talking about thousands of dollars worth of work, as well as the complicated negotiations between in-laws as to who would get which poster (the other poster was interesting, also by Steinlen, but it wasn’t nearly as significant as the iconic Lait Pur Sterilise) – and in some bizarre way, I felt honored with the trust and confidence these meticulous people were showing me. It took two restorers more than a year to bring Colette back to life (2). When she returned to me, she looked much as she had when she originally came off the press: clean, pure, and very much as Steinlen had designed her more than a century before. Both my clients and I were very pleased with the results. Some months later my dapper French Canadian lawyer client returned with another poster rolled under his arm. When I unwrapped it I recognized as a Cheret – well, more precisely, as a piece of a Cheret (3). The poster my client presented me with was a variation of a poster Cheret produced for a company called Saxoleine – producers of lamps and lights in Belle Epoque Paris. Although Cheret is not one of my favorite artists, I was familiar enough with his work to recognize that this fragment was roughly one quarter of its original size, and it too was in sorry shape. 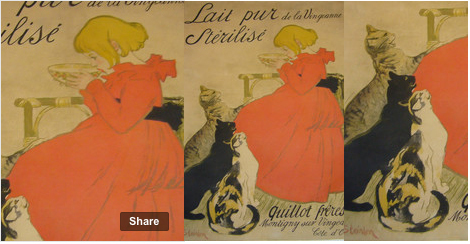 I suggested that it would be less expensive to buy an original, full size Cheret poster of the same theme – possibly even the same image- than it would be to reconstruct this poster as we had the Steinlen. But this time the client needed no time to think. He wanted the work done – it didn’t matter how long it took or how much it cost. Again I sent it to New York, and again it took months of work to recover and reconstruct the poster to its original color and beauty. When I finally received the Cheret from the restorer I called the client to tell him his poster was ready and we made an appointment for him to come collect it. In the meanwhile, I had done some research and had printed out for him an image of what the entire poster had originally looked like – from the piece I had restored I knew precisely which poster it was. I had placed this image next to his restored fragment. Once again, this formal, elegant, tall and distinguished man came to the gallery, but this time, his reaction upon seeing his restored poster was completely unexpected – both to him as well as to me. He looked at it, and looked at the image I had printed out for him. He looked up at me, and looked again at his poster. When he began to speak, he had tears in his eyes. “I remember now”, he said, haltingly, “I remember it was in grandmama’s house, under the stairs… and when we had a leak, the ‘homme a tout faire’ cut it out of the frame and tacked it back on the wall so we could still enjoy it. I remember it now…” Suddenly, he was a little boy again, in his ancestral home, looking up at this Cheret poster that must have, at the time, been colorful and beautiful and lush. And he remembered the smells of the house and the sounds of it, and all of that came tumbling out of the mouth of this reserved and usually reticent lawyer in short, breathless bursts… It was the poster that brought it back to him – this fragment of a poster which had been produced more than a hundred years previously, and which had been in his grandmother’s home. A poster which had long been forgotten and rolled up in an attic, and which now was able to bring this older man back to his childhood more clearly than anything else had in a very long time. When I think of posters, and their power, this is the story I tell most often. It gives me goose bumps every time because it is real, and to me it shows the awesome power that posters have to evoke a time, an idea or a memory. Not every poster can bring you back to your youth, nor is every poster significant. But I believe that there is something inherent in this art form which I love that manages to bridge history, memory and the desire to understand both that transcends the images of the posters themselves. That is why I opened L’Affichiste, and it’s why I love walking into my gallery every day. Colette is featured in a number of Steinlen works, and as a cat lover, he managed to populate many of his posters with his pets. His Chat Noir poster is as classic as the Lait Pur Sterilise. Vintage posters are most often lined on linen – literally glued to the fabric to help them maintain their physical integrity. When these posters were initially produced, they were intended to be ephemeral – to last a few weeks posted on a kiosk outdoors – and were printed on the cheapest newsprint available. When my client’s poster was removed from it’s original linen to be re-lined, it disintegrated into small pieces and had to be painstakingly put back together like a jigsaw puzzle. Its creator, Jules Cheret, is known by many as the father of the French poster – the man who is credited with modernizing the printing press, the manner in which posters were created, the colors with which they were printed – and an artist with an instantly recognizable style. Cheret loved women and drew them with fluff and froth, so much so that the women in his posters were called Cherettes.